What is included in the complete curriculum? Answer: You’ll receive all 4 DVDs and 3 books when you purchase the complete curriculum. Twenty-four full-length video lessons provide all of the necessary instruction. Lessons average 45 minutes each. The lesson book contains all of the vocabulary, action sequences, and skits taught in the videos, plus an independent reading selection (a cute story) for each lesson. The separate workbook provides reinforcement, practice and review. The answer key furnishes the correct responses for both the lesson book and the workbook. This whole program is appropriate for multiple ages, learning styles, and objectives. Where can I get the question words posters I see in the videos? Similar posters are available to download and print for FREE here or here. You can also find a link to some at this site. Enjoy! Will Excelerate SPANISH count as a high school credit? Answer: Please check the requirements for your state’s department of non-public instruction. The short answer is: Whatever your homeschool administrator (i.e., you or your spouse) says counts as a high school credit, counts. According to the NC DNPE: “When a student successfully completes his/her non-public school’s academic requirements for high school graduation, the non-public school itself (not a government agency) maintains academic records of the student’s high school academic work and issues student transcripts and graduation verifications in future years as requested. State government provides no student graduation verifications for non-public school graduates (whether from a private K-12 or a home school) nor does it maintain or keep student academic records or transcripts — only records concerning the legal existence of such schools.” (from http://www.ncdnpe.org/FAQs/hhh114u.aspx, emphasis mine). The long answer to your question is this: I have taught Spanish using traditional textbooks (with supplementation), I have taught Spanish using straight TPR (Total Physical Response), and I have taught Spanish using TPRS (Total Physical Response Storytelling, also known as Teaching Proficiency through Reading and Storytelling). By far, my students who learned with TPRS have out-performed those who did not. Please read my article on this subject here. 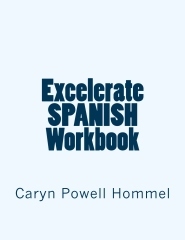 UPDATE, FALL 2013: A colleague in western NC reports that Spanish II students who used Excelerate for Spanish I are outperforming the students who had Spanish I using other methods! Orders are typically shipped within two business days via USPS Media Mail, a cost-effective option that allows me to offer you FREE shipping. After your package reaches the post office, it may take up to one week for delivery (assuming your shipping address is within the Continental United States). If you need to upgrade to Priority Mail, please contact me to make payment arrangements for this (email info@ exceleratespanish.com; remove space). Your business is truly appreciated! How long does it take to get through the entire book? Answer: In my live classes, we take two weeks to cover most lessons, so there are over 40 weeks of material at that rate. Last year, however, we tackled a whole lesson each week and interspersed four review lessons, totaling just 28 lessons. My preference? Going slooower. Is there an Excelerate SPANISH level two, level three, etc? Answer: The level two curriculum is now available for purchase on the products page! By this point, I hope that your student has attained a fair level of confidence with the language and feels capable as an independent learner. The following resources were developed by public/private school Spanish teachers for level 3 students, and I believe that your student will be able to use and benefit from them. Feel free to use OR reject any of these resources according to your own needs and interests! You will note that these plans utilize Spanish novels. Don’t be intimidated, please! These novels were written specifically BY Spanish teachers FOR Spanish students– students just like yours! I am very confident that your student(s) will glean a great deal from the novels, enjoy them very much, and feel just great about it! Is Excelerate SPANISH suitable for use in the classroom of a more traditional school? Yes, certainly! 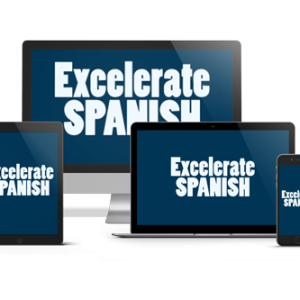 Excelerate SPANISH can be used from the beginning or as a temporary solution to substitute for a teacher who is unavailable. If you are interested in using Excelerate SPANISH in a classroom setting, more information is available here. Answer: Native Italian speaker Chiara Liotta has translated Excelerate into Italian. We are excited to be able to offer this soon! French is also in the works. Additional languages will be made available as our connections and resources foster their development. Your support will help to make that happen more quickly! I can’t use the DVD in my computer. Help! First, please understand that these are regular DVD discs, not CD-roms. They really are not intended for use with a computer. A DVD player will give you a better experience. If you must use a computer to view the DVD lessons: Unfortunately, the discs were mastered with a codec that is no longer supported by Apple. Fortunately, you can simply download a free Media Player and the discs will work fine with that. Just choose File > Open Disc with it in your drive. Thank you for your patience, and I am very sorry that you must take this extra step to use the discs on your computer. If you decide to purchase a DVD player, this one is relatively inexpensive and has good reviews on Amazon.